You can no longer go to an insurer and buy riders that pay your entire hospital bill, as the Government is rolling back a regime that threatens to make health insurance unsustainable. Anyone buying a new rider from today will need to eventually pay at least 5 per cent of his hospital bill. But the total amount a policyholder has to pay can be capped at $3,000 a year, although insurers are free to set a higher threshold. This is to give people the peace of mind that they will not have to dig too deeply into their pockets, whatever the size of their hospital bill. However, the $3,000 cap applies only if patients are treated by doctors on the insurer's approved panel, or if they had received prior approval from the insurer. Otherwise, they have to pay the 5 per cent, with no cap on their share. These measures were announced in Parliament yesterday - the same day that The Straits Times reported that insurers had asked the Ministry of Health (MOH) to get people to pay at least part of the bill. MOH has agreed to this for new riders. However, it has not mandated any change for the 1.1 million people who already have full riders for their Integrated Shield Plans (IPs) - which means they pay nothing for hospital bills. MOH is giving insurers until April 1 next year to come up with new riders that include the co-payment and cap. At that point, no full riders for IPs can be sold. Meanwhile, anyone buying a rider from today has to switch to the new scheme by April 1, 2021, at the latest. Elaborating on the scheme, Senior Minister of State for Health Chee Hong Tat said: "Any pre-existing conditions that are covered prior to the switch will not be excluded." This should also apply to people with full riders who want to switch to the new scheme. Mr Chee said: "We expect the new riders to have lower premiums than full riders, so the switch will result in premium savings for policyholders." As for those who already have riders, Mr Chee said: "We recognise that existing rider policies are commercial contracts between insurers and their policyholders. "If insurers intend to make changes to their existing policies, they should consider the interest and well-being of all policyholders, as they seek to keep premiums affordable for everyone in the longer term." Health Minister Gan Kim Yong told Parliament that co-payment is an integral part of healthcare schemes as zero payment "dilutes the personal responsibility to choose appropriate and necessary care". It would "encourage unnecessary treatment, leading to rising healthcare costs not only for those with such riders, but for all of us", he said. All six IP insurers faced underwriting losses in 2016, but Mr Chee made it clear that this did not influence the latest move. He said: "Let me be clear that MOH is not issuing these requirements to bail out the insurers. Our objective is to address the concerns with over-consumption, over-servicing and over-charging." Already, over-consumption on the part of those who do not have to co-pay their bills is putting a strain on the system. People with full riders have bills that are 60 per cent higher than those without riders. The situation could become more dire if left unchecked as riders are becoming more popular. About 100,000 new ones are sold a year. Health economist Phua Kai Hong of the Lee Kuan Yew School of Public Policy said the new move is one of several actions that MOH is taking to curb spiralling costs. Another important move, he said, are the fee benchmarks coming out later this year, which will provide a yardstick for medical charges in the private sector. Significant premium increases may be a thing of the past following the Ministry of Health's decision to disallow further sale of full riders for Integrated Shield Plans (IPs), a move that is set to benefit both consumers and insurers. In a statement yesterday, the Life Insurance Association of Singapore (LIA), which represents all six insurers offering IPs, said it believes having patients pay a part of the bill would "encourage consumers to play an active role in choosing their medical providers and treatments". It would also get doctors to "recommend medically appropriate and cost-effective treatments", it said. As for insurers, the LIA said the move will help them manage claims and reduce the need for significant premium hikes, and allow IPs and riders to remain "viable and sustainable options". An Aviva spokesman said it is too early to comment on the possible impact, but "welcomes this as part of the efforts to overcome escalating healthcare costs". Mr Lee Swee Kiang, head of group product management at Great Eastern (GE), said it will come up with new riders to incorporate the 5 per cent co-payment with an annual cap of $3,000 - the minimum mandated by MOH. There will be no immediate change for existing customers, he added, but GE will "closely review and assess the need to make benefit changes", which it will inform customers of in due time. He also said it was "too premature to make any definitive comments on the impact of these changes". Prudential said it already has in place a scheme to "encourage healthy living and more prudent use of medical services". It introduced claims-based pricing last year. Depending on the size of claims, if any, policyholders fall into one of five tiers deciding the premiums they need to pay. Prudential's chief agency officer Roy Lim said those on this plan "will continue to enjoy first-dollar coverage as the plan's claims-based pricing feature has been shown to encourage more prudent use of medical services". Ms Mimi Ho, chair of the Health Insurance Task Force, which recommended co-payment as a way to curb rising healthcare costs, was pleased with the move. She said it was an essential step, and will complement others such as fee guidelines and helping insurers surface inappropriate treatments. Q What is the difference between MediShield Life and an Integrated Shield Plan (IP)? A MediShield Life insures for care at subsidised classes, with premiums entirely payable from your Medisave account. People who want private treatment need more coverage, which the IPs provide. Premiums can be paid with Medisave, up to a cap based on age. Today, 68 per cent of people here have IPs. Q How many types of IPs are there? A Six insurers are allowed to sell IPs, with plans pegged at private hospitals, public hospitals' A class and public hospitals' B1 class. The Ministry of Health (MOH) requires all IPs to have a deductible of up to $3,500 a year, depending on the ward class. This is the amount the patient has to pay before insurance kicks in. It is cumulative and can be made up of several bills within the year. On top of that, patients also need to pay 10 per cent of the rest of the bill. A Riders can be bought on top of the IPs. There are two types of riders. About 1.1 million people have full riders that pay the deductible and the co-payment, so patients do not need to pay a cent of their hospital bills. About 200,000 people have partial riders - like the one that MOH will now require - where the patient has to pay a small portion of the bill. Q Why is MOH making changes to riders? A People who have riders have bills that are, on average, 60 per cent higher than people who have only IPs without riders. Some of this comes from over-servicing or over-charging by doctors. The high bills have pushed up premiums for everyone, not just those with riders. Over the past two years, rider premiums have gone up by up to 225 per cent, while IP premiums have risen by up to 80 per cent, with older people paying more. Total IP and rider claims rose from $858 million in 2015 to $1.05 billion in 2016. The six insurers have tried to absorb much of the increase. As a result, all suffered underwriting losses in 2016. This was why they appealed to MOH for help. MOH fears that should this continue, it would push up health-care costs for everyone, including those who are on only the basic MediShield Life. This is because all IPs incorporate the basic scheme. Higher IP bills also mean higher payouts from MediShield Life, pushing up its premiums. Q I already have an IP with rider. What will happen to my plan? A The new rules do not apply to you. You may continue with your existing coverage. But note that insurers are allowed to change their products. Some may decide to do so as their experience is that people with full riders tend to have higher claims. You might also be given the choice to switch to new schemes with lower premiums that will be rolled out. Q So, should I switch? A Experts say that factors you should consider include your age and health. For example, you might want to see how much you save in premiums each year, and multiply that by the number of years you expect to require few major healthcare treatments. Although you have to pay 5 per cent of the bill under the new scheme, the maximum you might need to pay in a year is $3,000 or any higher cap your insurer offers. One consideration is that this amount can come from Medisave, but the premium for your rider cannot, and has to be paid in cash. Based on 2016 bills, 5 per cent co-payment comes to $670 or less for three in four people who made claims that year. Dr Jeremy Lim, a partner at consulting firm Oliver Wyman, said: "I am reasonably confident that the difference in premium between the full and 5 per cent rider will continue to widen and, in the years to come, it will become more and more obvious that the full rider will not make sense for the vast majority of Singaporeans." Q What will the rules mean for new IP rider plans? A If you are buying a rider from today until March 30, 2019, you can be fully covered until April 1, 2021, when you must switch to the new plan where you pay at least 5 per cent up to a maximum of $3,000 a year - or higher amounts set by your insurer. This payment by you can be paid with Medisave money. Your insurer must offer the new plan by April 1 next year, so you may choose to switch to the new plan earlier to save on premiums. Q Does the $3,000 annual cap mean that no matter how big my bill is, that is all I need to pay? A Yes, but only if you are treated by the insurer's panel of doctors or have received pre-treatment approval from the insurer. Should you choose to go to a doctor not on the panel, or seek a treatment that has not been pre-approved, the insurer will not cap your contribution at $3,000 a year. This means that you will have to pay 5 per cent of the bill, no matter how large it is. Q What if my insurer does not have a preferred panel of doctors or pre-authorises treatment? A Today, four insurers have these in place. The other two will likely also have them by the 2019 deadline. But should your insurer not have panels or pre-authorisation, then you will still need to pay 5 per cent of your bills, and there will be no cap to the amount you need to pay. Q Is it too late to buy a rider plan that covers 100 per cent of my bills? A Yes. Insurers are no longer allowed to offer full riders. They may only sell riders that convert to partial riders by April 2021. Soon after The Straits Times reported yesterday morning that six companies selling MediShield Life-linked health insurance had appealed to the Health Ministry (MOH) for policyholders to pay part of their hospital bills, insurance agent Alfred Toh was contacted by five of his worried clients. They are among the 1.1 million people who already have full riders for their Integrated Shield Plans, which cover the deductible and the co-payment. Later yesterday evening, the Government announced that those buying a new rider will need to eventually pay at least 5 per cent of their hospital bill. Mr Toh, 35, who is with Great Eastern, said soon after the announcement that six more clients contacted him. Their applications, which include full riders, are currently being underwritten by him. Anyone buying a rider from today has to switch to the new scheme by April 1, 2021, at the latest. With the changes, the total amount that a policyholder has to pay can be capped at $3,000 a year, although insurers are free to set a higher threshold. This cap applies only if patients are treated by doctors on the insurer's approved panel, or have received prior approval from the insurer. Otherwise, the 5 per cent co-payment will not be capped. MOH is giving insurers until April 1 next year to come up with new riders that include the co-payment and cap. In announcing the changes, Senior Minister of State for Health Chee Hong Tat said they are to address the concerns with "over-consumption, over-servicing and over-charging". Policyholder Cathie Chew, 46, recently enhanced her coverage with a full rider that went into effect on Monday. While relieved, she said the changes do not target the root cause - the few "rotten apples". Ms Chew, who is also an insurance claims specialist, said: "Look at the few fraudulent cases, how they came about, and bring these people to task." A spokesman for AIA Singa-pore said its clients will be informed of any changes to their coverage at least 31 days before the change takes effect. Meanwhile, AXA said it in-tends to adopt the guidelines and offer the co-payment and cap rider for new customers by April 1 next year. When asked about clients misusing full riders, insurance agent Lim Yao Hui, 37, said healthcare professionals are also responsible for overprescribing treatment and medicine. "If you are a policyholder with abdominal pains and are referred to a specialist by your general practitioner, and if the specialist recommended a diagnostic test, you wouldn't say no, would you? "We insurers are doing our best, but the doctors also have to make better judgment." One could argue that the six insurers selling Integrated Shield Plans (IPs) had brought their troubles on themselves. When MediShield was set up in 1990 to cover big hospital bills, patients had to pay part of their bills, precisely to encourage prudent behaviour. Private insurers were allowed to sell shield plans that offered coverage for higher classes of care. Premiums for these plans can be paid with Medisave, so long as they meet criteria such as having a deductible, which is the amount patients need to pay before insurance kicks in, and co-insurance of the rest of the bill. 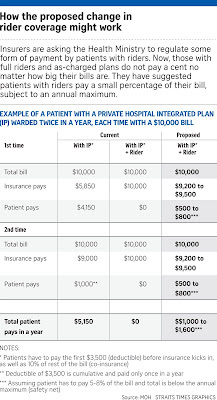 But in competing for market share, private insurers offered riders to cover the individual's portion of the bill, so people would not need to pay. The Ministry of Health (MOH) could not stop this. But it did not allow Medisave money to be used to pay the premiums for riders. With claim limits for shield plans, costs did not soar until 2005, when one insurer introduced "as-charged" private plans, which meant it would cover whatever the hospital or doctor charged. By the following year, all insurers were selling as-charged plans. People with riders on as-charged plans could chalk up enormous bills with no impact on their own pockets. The brakes were off, and healthcare costs spiralled. Today, claims from people with riders are 20 per cent to 25 per cent higher than that from those with no riders. As the vast majority of people with riders are younger - mostly below the age of 55 - their higher claims are even more inexplicable. But to cover these high claims, insurers needed to make hefty increases in premiums, not just for the riders, but also for the IP. Nonetheless, claims continued to outpace premiums and, in 2016, all six insurers found themselves facing underwriting losses. Now, these companies, which landed themselves in a hole, are appealing to MOH to get them out of a bind by outlawing riders which offer blanket coverage. Should MOH step in? After all, if the companies are facing losses, it is a problem of their own making. Normally, business problems should be left to industry to solve. There are, after all, risks to doing business. However, insurers will not act unilaterally for fear of losing market share, but cannot get together to implement changes as this contravenes the Competition Act. So, without MOH intervention, nothing will change. But the high claims from the 1.3 million people with riders end up pushing up healthcare costs for everyone and not just themselves, as seen by premium increases for IPs. Following the one-year moratorium imposed by MOH with the launch of MediShield Life that ended in November 2016, premiums for private hospital plans have gone up, with most increases in the 20 per cent to 40 per cent range. There is a five-year freeze on premiums for the basic MediShield Life, but the spillover effect from large claims has also increased the amount withdrawn from the basic scheme as it forms part of IPs. If nothing is done to curb these large claims, the people who are only on the basic scheme might be faced with big premium increases at the end of the five-year moratorium. The Health Insurance Task Force report in 2016 said that since insurance is based on risk pooling, "a higher level of insurance claims will eventually result in a higher level of premium". As runaway healthcare claims impact everyone, not just insurers and people with riders, this is a situation where the Government should intervene. 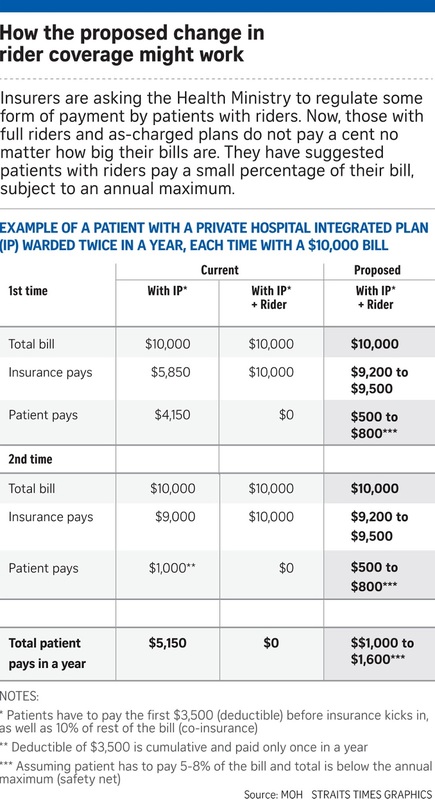 If getting people to pay part of their bill reduces the difference in claims between people with riders and those who do not have them, it would go a long way in slowing down medical inflation. Slow premium increases would also benefit those with riders, even as riders continue to protect them against really large bills. 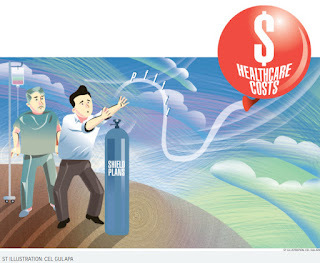 In late 2016, the Health Insurance Task Force, comprising industry and government representatives, recommended several actions to slow down healthcare inflation, which had been running about 50 per cent higher than general inflation. Healthcare inflation rose by 30.6 per cent in the 10 years from 2005 to 2015, compared with a 21.7 per cent increase in general inflation. Action was needed, it said, as the speed at which claims had been rising over the past decade would eventually result in health insurance premiums becoming unsustainable and less affordable. The main concern was with escalating bill sizes from private hospital treatments. Between 2012 and 2014, private hospital bill sizes went up by 8.7 per cent a year compared with a 0.6 per cent rise in public hospital bills. The unchecked growth, it said, was due largely to the riders that people could purchase on their insurance plans which would cover nearly, if not all, of a hospital bill. Currently, two in three people here have Integrated Shield Plans, with the majority covered for private-sector treatment. Insurance plans usually come with a deductible of up to $3,500 a year, which patients have to pay before the insurance company takes over payments. All plans also require patients to pay 10 per cent of the rest of the bill. But policyholders can buy riders that take care of both the deductible and co-payments, leaving them with nothing to pay. Over one million people have done so. The task force found such people were not only chalking up more bills, but their bills were also 20 per cent to 25 per cent higher than that of people with the same plan but no riders. The task force suggested making patients pay part of their bill to avoid "risks of overconsumption". This is what the insurers now hope to do with the help of the Ministry of Health (MOH). • Fee benchmarks, so patients as well as insurers can assess if they are being charged normal rates. The MOH has announced that it will introduce such benchmarks later this year. • A clearer process when faced with claims for inappropriate medical treatments, so the insurer can raise this with the authorities. • Panels of preferred healthcare providers set up by insurers. Four insurers have done this and are encouraging policyholders to use them by offering better coverage if they do. • Pre-approval of treatments, which the same four insurers have also begun doing. • Educating consumers on what is available and what the likely cost will be so they can make informed choices. The Health Insurance Task Force noted that patients who did not have to pay for their medical treatment often racked up large bills at private hospitals. • A 37-year-old woman stayed seven days in hospital for abdominal hernia repair. Of the $46,000 bill, the surgeon's share was $31,900, or five times the norm. It transpired that while in hospital, she also had her breast augmented, and a tummy tuck with the fat transferred to her buttocks, but since these are not covered by insurance, none of this was stated in the bill. • Another patient who needed cataract surgery opted to be admitted to hospital, instead of having it done as a day procedure, which would have taken no more than an hour or so. His one-day stay each time for each eye amounted to a total bill of $21,000. The median private hospital bill for cataract surgery of one eye is $5,000. • A patient with fungal growth in her nail stubbed her toe, causing the nail to fall out. She was admitted for two days and was billed $6,000. • A patient complaining of stomach and chest pains was admitted to hospital, and underwent gastroscopy and colonoscopy procedures to check his stomach and intestines. He was also referred to a heart doctor, a dermatologist for skin rash and an ophthalmologist for blurred vision. The total bill for his one-day stay was $14,000. • A patient was admitted for 16 hours for inflammation of the gall bladder. The tests showed no inflammation and no treatment was needed. However, the patient was given a series of unrelated screening tests, including an electrocardiogram, a magnetic resonance imaging scan and a computerised tomography scan. Screening is not covered by insurance. The bill came to $11,000. • A woman was warded for 42 days for cervical sprain and strain (or pain in the neck) but received treatment only on seven days. She was given physiotherapy and painkillers for the other 35 days, something that could have been done as outpatient treatment. The bill was $84,000. • A 40-year-old man was warded for four days for pain and swelling in his big toe, chalking up a bill of close to $6,000. The bill was rejected after the insurer checked with the doctor, who said the patient was admitted at his own request and that the treatment would otherwise normally be done in the clinic.